I’ll admit it: I’ve been coveting a standing desk for years. The idea of escaping the uncomfortable prison of my 10-year-old desk chair is compelling. But standing desks are prohibitively expensive for many people, and up until recently that included me. It finally got to be too much, though. A few weeks ago I bit the bullet and, after doing extensive research on the various options available, finally settled on the NextDesk Terra. There are many companies that manufacture standing desks, but NextDesk seems to offer the best quality-to-price ratio. I also appreciate the built-in Belkin power strip. And let’s face it, their bamboo desk surfaces are downright gorgeous. And the motorized raising and lowering is definitely the “wow” factor. Is it necessary? Not really. I guess the argument could be made that the motor is saving my back from having to manually crank the thing up and down, but this being my first standing desk it’s hard to say how much more difficult a manual lifting mechanism would make things. But I’m happy with the motor. How often do I find myself standing now that I have the correct equipment? Almost all the time. I easily spend 80% of my work day standing. What’s nice about leaving the desk in its raised position is that it’s so easy to just walk up to the workstation and get something done. My office is in my converted dining room right next to my kitchen, so I’ll often find myself wandering over to get something done while I’m waiting for some water to boil on the stove, or waiting for the microwave to finish warming a bowl of soup. Eliminating the need to sit before using the computer has lowered a psychological threshold that was preventing me from handling small tasks when a few minutes of free time suddenly appeared in my day. When I had to sit, I wouldn’t bother because my brain was telling me it would take longer to perform the action of sitting than it would to get something done once I did sit. 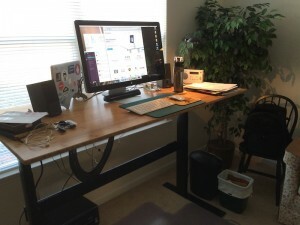 If you’re considering upgrading to a standing desk, I recommend glancing over this article which was instrumental in my decision. Do you already use a standing desk? Comment below and let me know which model you chose and what you like best about it. all I can say is … Desk envy. You’ve really got me thinking about it in my new office. Thanks for sharing. Glad I got you thinking. It’s a great way to work.